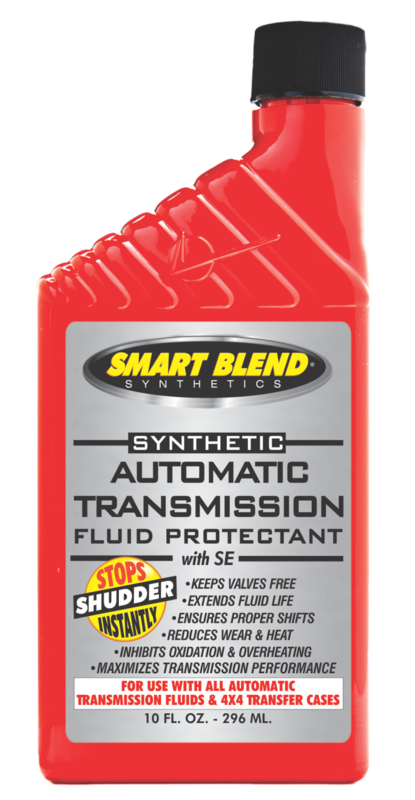 SMART BLEND SYNTHETIC Automatic Transmission Fluid Protectant is a uniquely blended synthetic product formulated for use in all automatic transmissions. Smart Blend Synthetic Automatic Transmission Fluid Protectant incorporates a high quality synthetic base stock with SE (synthetic esters) which reduces heat, wear, and extends transmission fluid life. Smart Blend Synthetic Automatic Transmission Fluid Protectant also incorporates friction modifiers, and boundary lubricants to optimize transmission performance while lowering operating temperatures. Blends with all domestic and worldwide OEM automatic transmission fluids.